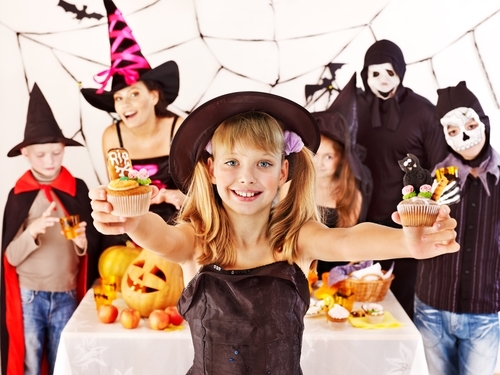 A spook-tacular Halloween celebration is the perfect way to connect with new customers. Both adults and children are more than happy to dress up and snack on candy come the end of October, so take advantage of this marketing opportunity for your small business. There are lots of great promotional products that are perfect to give away during the weeks before Halloween. If your office is located on a busy street, stay open late on Halloween to hand out goodies to trick-or-treaters. Chances are that your employees will love the chance to dress up and cause a little mischief. You can even let them decorate your store-front with spider webs, jack-o-lanterns and spooky lights. Make sure to invite customers to stop by during the weeks before the holiday. On Halloween night, don your costumes and wait in the doorway for candy-seeking kids. You can either hand out candy the traditional way, or put together some goodie bags with great branded promotional items. Gummy Bear Pillow Bags, Cone Promotional Flashlights and Brain Stress Relievers will make for fun and useful treats. If you’re displaying the grab bags on a table, make sure to use a Promotional Table Runner to identify your business. You’ll be surprised how many passersby notice your staff’s festive spirit and community involvement. If you’re not located on a popular trick-or-treat route, you can still get in on the fun by hosting a family event in the weeks leading up to Halloween. Single Platform suggested having a pumpkin painting night, giving out caramel apples or offering free items to patrons in costume. Customers will love having an excuse to wear their getup out and getting a treat in return. A Classic Tin of Butter Toffee or a Promotional Drawstring Backpack would be perfect prizes. Another option is to partner with a local costume or candy shop and promote each other’s businesses. You can give away coupons, hand out T-shirts or collaborate on a Halloween party. Working with another company is a great way to expand your customer base and throw a bigger bash than you could alone. Plus, it will build a good relationship that will be beneficial for marketing as the holidays draw near.